Our laminated Veterinary Science Cards provide the most important information on specific topics in a clear and concise manner. These practical, sturdy, easy-to-read reference cards are a must for the medical professional or interested lay person. 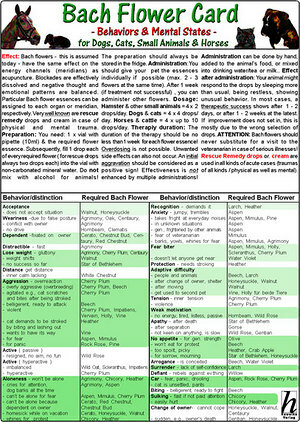 The Bach Flowers Card for Dogs, Cats, Small Animals & Horses - Behaviors and Affections card provides an introduction to and description of the use of Bach Flowers Therapy in dogs, cats, rabbits, guinea pigs and horses. It includes directions for preparation and dosage information according to animal, methods of administration, length of therapy and indications of usage for 198 different behaviors and mental states. Size: 5.8" X 8.3"